When this Regiment was raised in 1685, it was designated “Princess Anne of Denmark’s Regiment”. The title was changed when George I came to the throne, this time to “The 8th Foot”. The drawing shows a Sergeant wearing the uniform of 1828. Number 7 of 25 from “British Uniforms of the 19th Century” – a cigarette card series issued by manufacturer Amalgamated Tobacco (Mills). In the process of painting some more Crimean War personalities, I’ve been particularly concentrating on a specific character who, though unnamed on the box artwork, bears an unmistakable resemblance to the 7th Earl of Cardigan. Oil on millboard by Alfred Frank de Prades, 1854. (c) NAM. 1967-02-19-1. 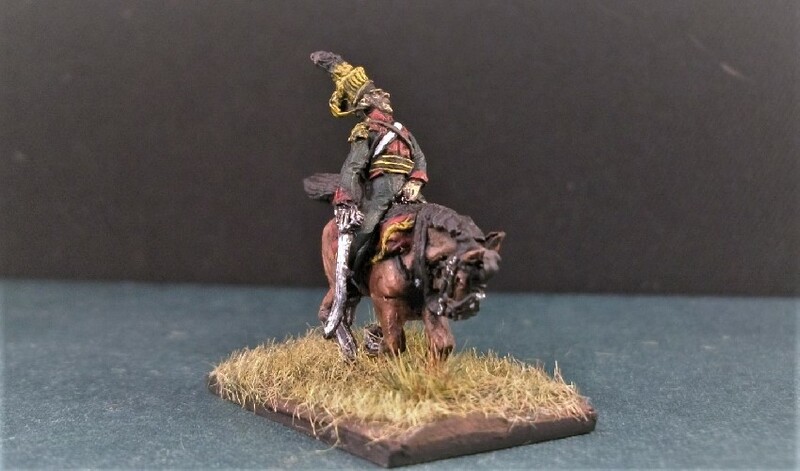 Strelets’ “Into the Valley of Death” set dedicated to the Charge of the Light Brigade was purchased about 5 years ago and the figure in question is wearing the uniform of a hussar. 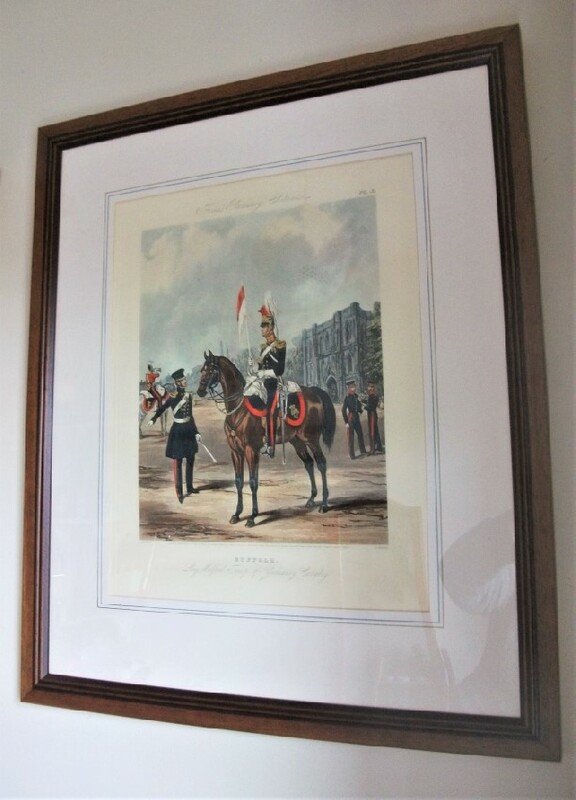 Given the set’s topic, this means that it must belong either to the 8th (King’s Royal Irish) Hussars or 11th (Prince Albert’s Own) Hussars. Plastic Soldier Review feel they can identify him – “The [figure] could well pass for Lord Cardigan, the man who actually led the charge.” There’s certainly a strong resemblance. 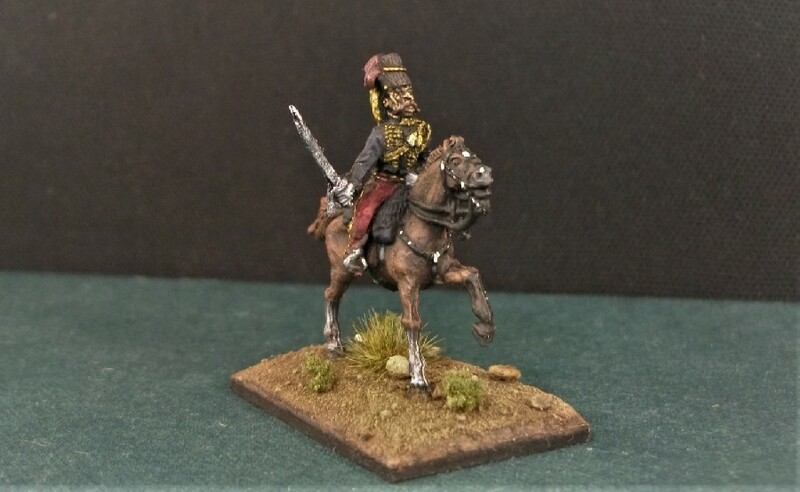 The Light Cavalry Brigade’s commander was Major General James Brudenell, the 7th Earl of Cardigan of the 11th Hussars. Arriving some months after the Battle of Balaclava, photographer Roger Fenton took some images of officers of the 11th Hussars, survivors of the charge, but not of the Earl of Cardigan himself. Below are his images of Cornet Wilkin and Lt. Yates of the 11th. Also below is Fenton’s famous image he titled “The valley of the Shadow of Death” itself, a gulley strewn with spent cannonballs. Detail of a painting by Richard Caton Woodville, Jr. Public Domain. That’s Ronald above, Cardigan’s charger shown as a small detail in Caton Woodville’s painting of The Charge. He was a thoroughbred chestnut gelding coincidentally sharing the same russet-colour as his owner’s ginger whiskers. Ronald was the horse that led the Charge of the Light Brigade, over 670 men (and their horses), into – and out of – the ‘valley of death’. 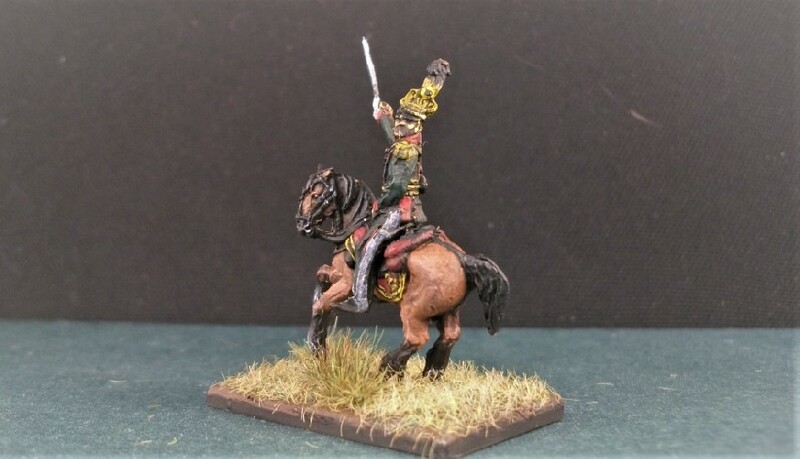 As with his aristocratic rider, Ronald was indeed incredibly fortunate to survive having ridden at the very head of the brigade right into the teeth of the Russian artillery position, escaped from being surrounded by Cossacks, and then returned all the way back again unscathed. Of the famous charge, a shocking 475 other horses failed to do the same. Furthermore, he should be considered very robust for even surviving the trip over to Crimea by troop ship (many horses did not), and then making the same arduous journey back home again. Of his many depictions, I’ve based my painting of Ronald on the Alfred Frank de Prades portrait. This shows Ronald to have markings consisting of two white ‘stockings’ and one white ‘sock’, although other portraits I’ve seen occasionally differ. I do know (thanks to the perfect preservation of his head!) that he had a star on his forehead and a snip near his right nostril, all of which I’ve been careful to try and reproduce on my own little tribute in 20mm figure form. Strelets horses certainly aren’t their strongest feature (the leg positioning on this figure isn’t quite right, I feel), but otherwise it’s not too bad a sculpt. The Earl of Cardigan himself is a pleasing figure, I think, and Strelets have captured something of his features and ornate uniform. 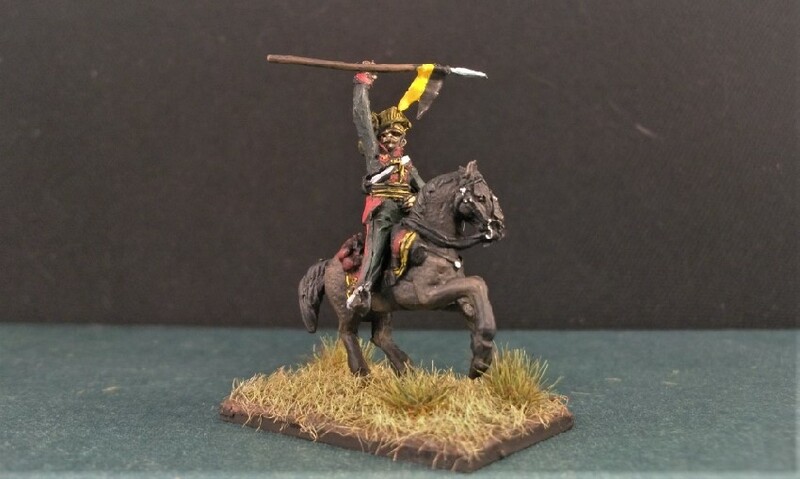 I’ve used a darker red than I commonly use to achieve the cherry colour of his busby bag and overalls, a feature unique to the 11th Hussars which gave rise to their nicknames “The Cherry Pickers” and “The Cherry Bums” or, for when ladies were present, “The Cherubims”! 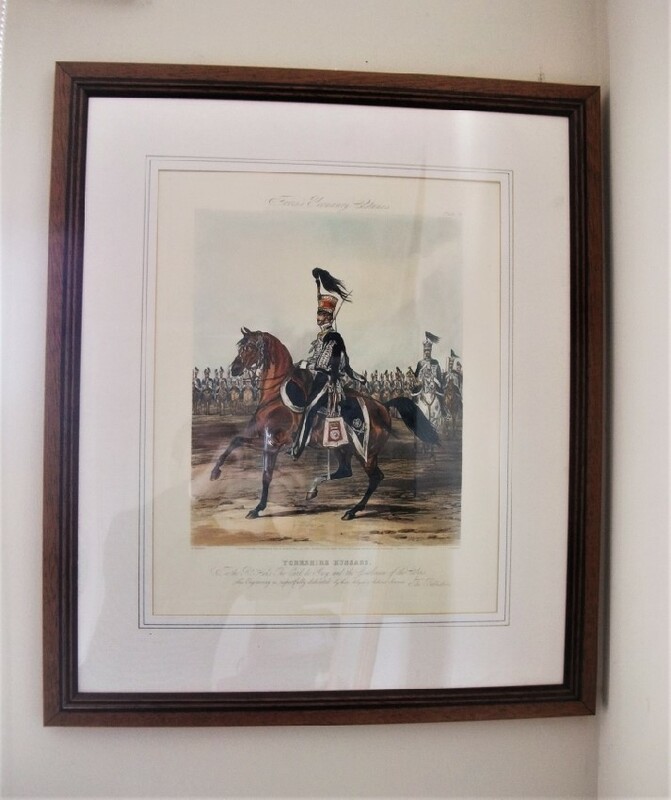 The doughty Ronald was the subject of a surprising number of paintings and prints, it seems, including many images of him and his master during The Charge while some prints of the period depict Ronald alone, suggesting something of his popularity. From an article by Cheryl R Lutring. Such was the affection felt for Ronald by the Brudenell family and the British public that, when he did eventually die, the Brudenells preserved his head and tail which continues to be displayed at his home in Deene Park, Northamptonshire. His hoof was turned into an inkwell (a popular tribute for beloved horses of the time) with a sculpture of him and his master atop. I’ve handful more ‘personalities’ I’m working on, which I’ll doubtless share in due course. 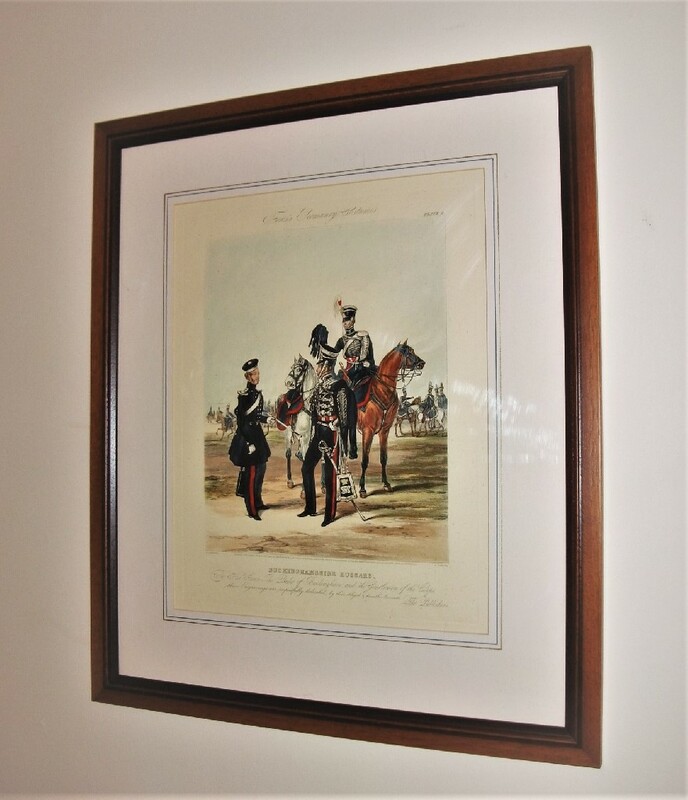 The 16th Regiment of Foot, of which we show a private in 1828, was raised in 1688. In 1782, the regiment received the county title of “The Buckinghamshire Regt”. The Hertford Militia became a battalion in 1881 when the regiment became known by its present title. Number 6 of 25 from “British Uniforms of the 19th Century” – a cigarette card series issued by manufacturer Amalgamated Tobacco (Mills). The first Battalion became the 30th Foot (Cambridgeshire) Regiment in 1782 and it was amalgamated with the 59th Foot (Nottinghamshire) Regiment in 1881 to form The East Lancashire Regiment. The drawing shows a Private of the old 30th Foot in 1815. Number 5 of 25 from “British Uniforms of the 19th Century” – a cigarette card series issued by manufacturer Amalgamated Tobacco (Mills). 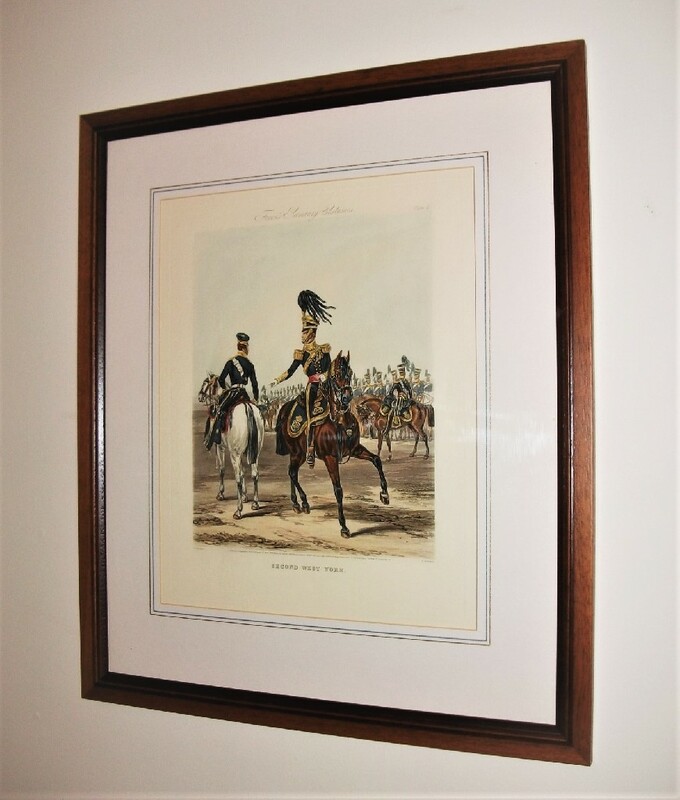 A short post to celebrate the display of all four of my 1840s prints of Fores’ Yeomanry Costumes, which are now all framed and up on the wall at home. Number 4 of 25 from “British Uniforms of the 19th Century” – a cigarette card series issued by manufacturer Amalgamated Tobacco (Mills). 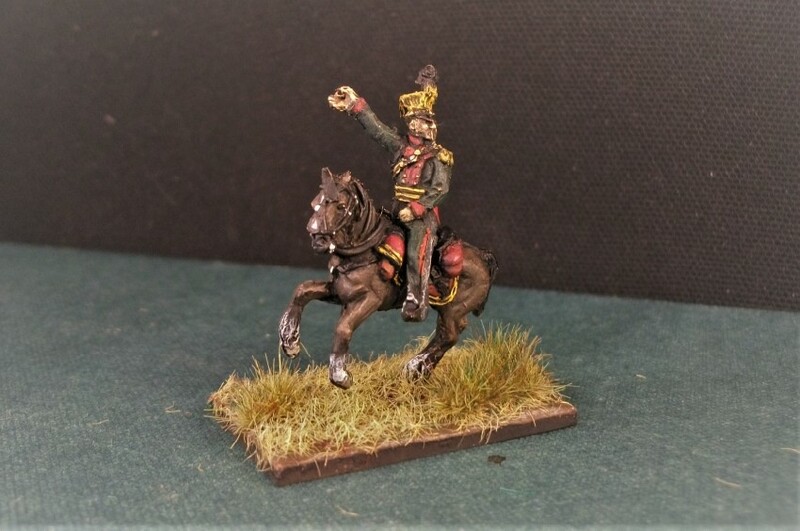 My 32nd regiment in the Napoleonic Cavalry Project reaches its completion with the basing of Merveldt’s Uhlans (Uhlan Regiment No.1). The figures are by Mars about whom’s merits I discussed in a recent post. I won’t pretend that they were the easiest paint, and I can’t exactly say that they’re perfection incarnate, but I do reckon I’m satisfied with the end result! It’s good to have some Austrians as part of the project at last. The most tricky aspect of the figures was perhaps the attachment of the lances to the figures. The hands were very indistinct and so I simply attached some old Esci Polish Lancers versions to the hand area with a blob of glue. Job done. The curious horse poses allow for only certain figure combinations. Hence, one horse appears to be charging hard into the ground, presumably felled by a bullet. The only figure which satisfactorily sits with this equine this the man leaning backwards in a kind of counter-balance. 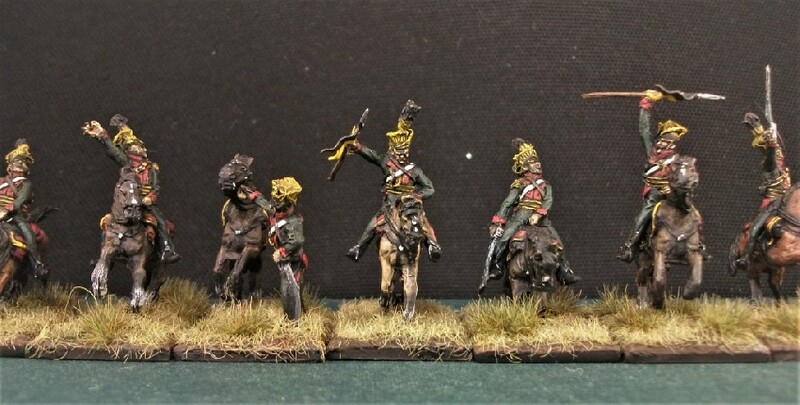 Three of these figures means that a quarter of my regiment is in the process of being felled by a volley! It makes for a unique, dramatic and interesting pose, though. The rearing horse allows for two standing figures, who, in another pleasing pose, appear to be desperately holding on to their agitated mount by the bridle. This was likely a not uncommon situation in battle. A spare figure without any horses left to hold I simply gave a lance to, thrusting his weapon in the air and urging his comrades on… or perhaps admiring it… or waving it for attention… OK, possibly an unconvincing pose! 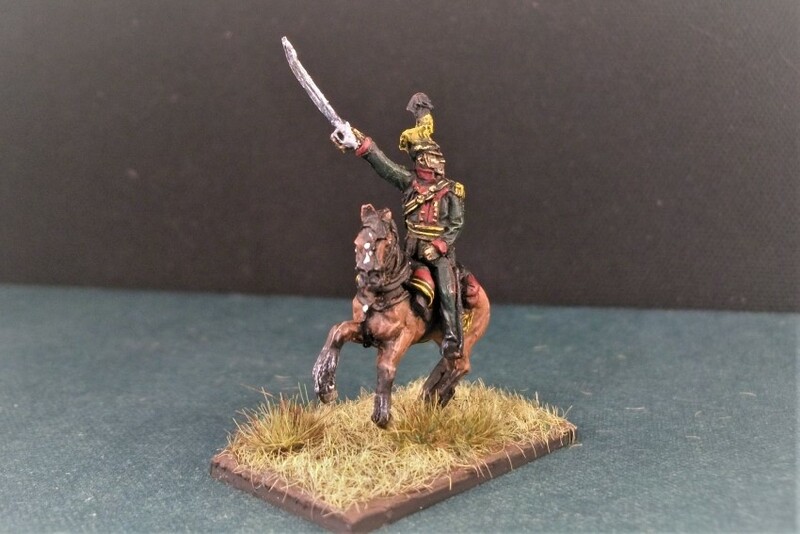 Austrian Uhlan officers would not have had lances and so I’ve attached a sword which came with the Mars set to one of my officers but left the other simply gesturing heroically to his men. They have black pouch belts with gold edging. 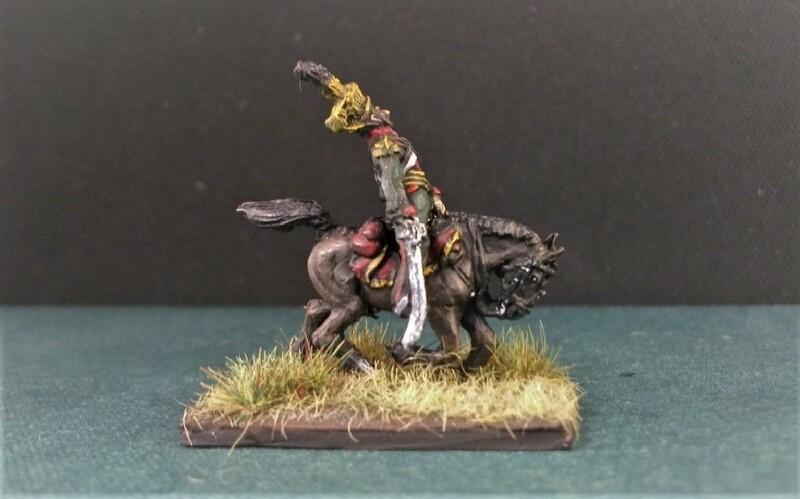 The remaining figures include this one urging his horse forward and thrusting the lance. Also, there is the figure with his arm held high in the air. Another slightly curious gesture, but not a bad one by any means once the lance is attached. So that concludes regiment number 32 in the old ‘NCP’. 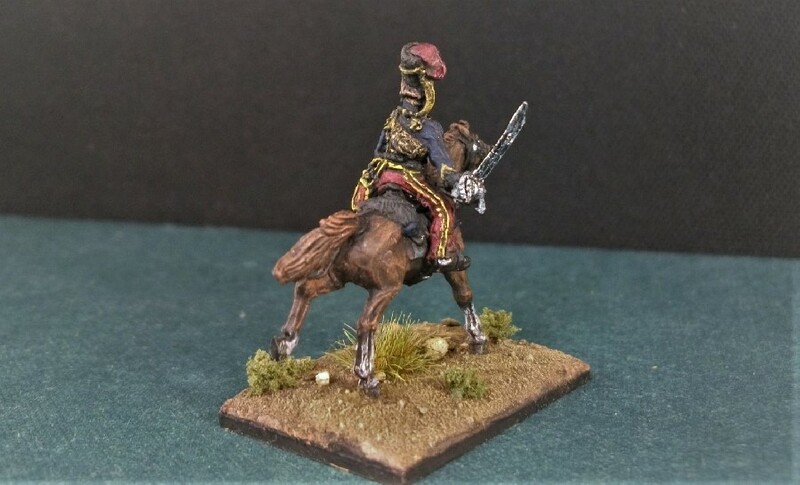 Slated as the next regiment in the endless project are some figures which may see me make a return to painting some French cavalry. More on this anon. Until then, I continue the tradition of a sort-of-biography of the latest completed regiment. 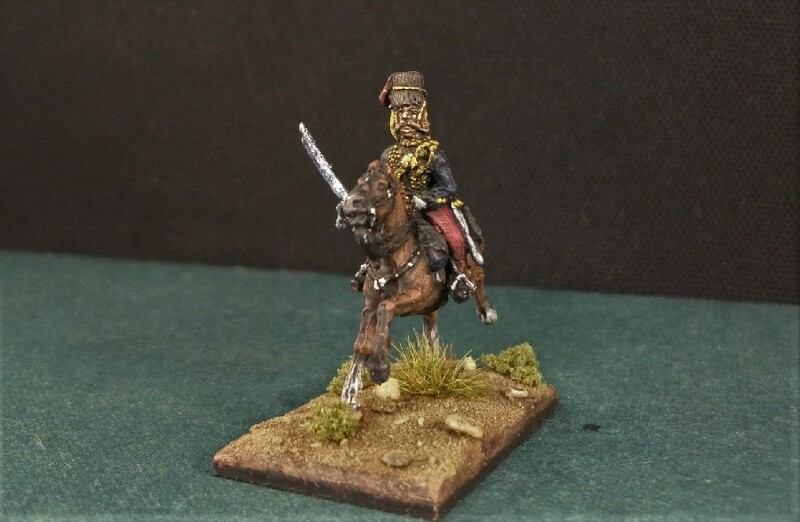 Austrian Uhlans were effectively Polish lancers and were dressed as such. Their country came under the leadership of the Habsburgs after 1772 when that empire gained part of the territory (Galicia). The first uhlan unit, the “Uhlan Pulk” was raised in 1784 with 600 men intended for use against a rebellion in the Netherlands. Later it was renamed the “Uhlan Freicorps”. A Richard Knotel illustration of a Merveldt Uhlan in 1813. 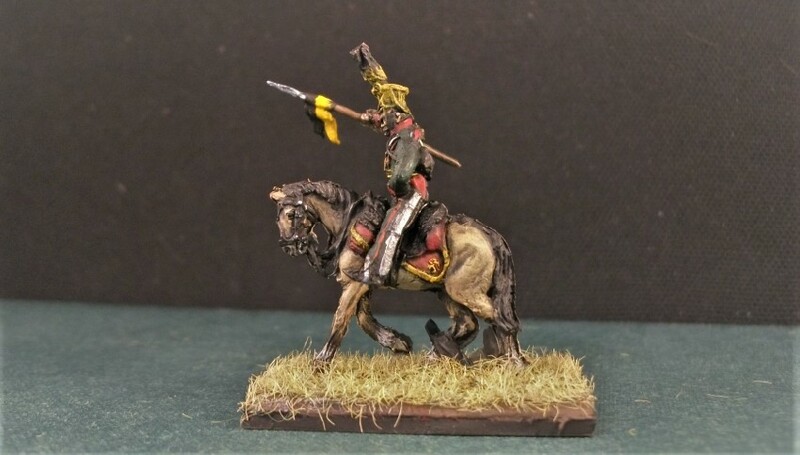 In 1785, this unit was sent to Vienna and broken up into various uhlan units attached to a variety of chevaux-leger regiments. 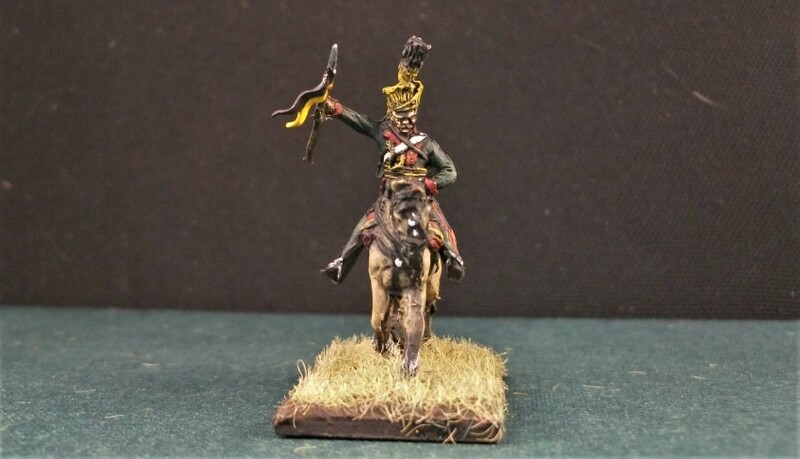 The first Uhlan Regiment, No.1, was raised on 1 November 1791 from those Uhlans existing in the Kaiser, Karaiczai, Lobkowitz and Levenehr chevaux-leger regiments. 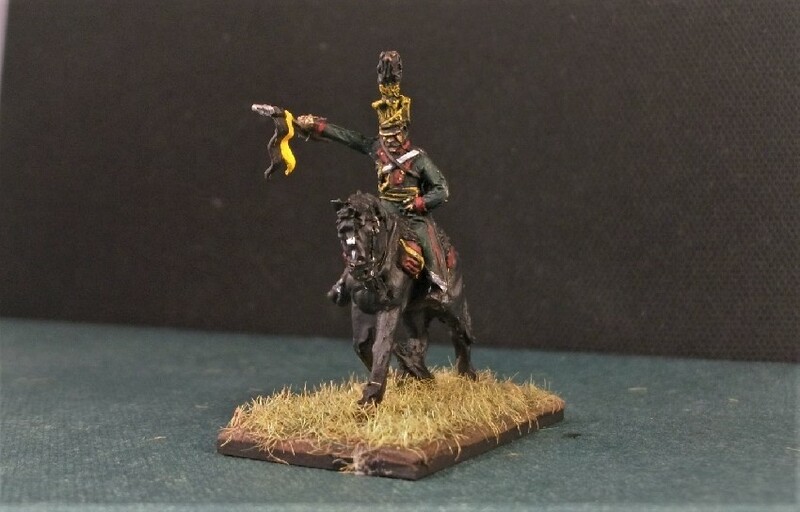 This 1st regiment of Uhlans were known as Merveldt’s Uhlans in 1796, after the regiment’s proprietor (a position similar to that of honorary colonel), Maximilian, Count von Merveldt. 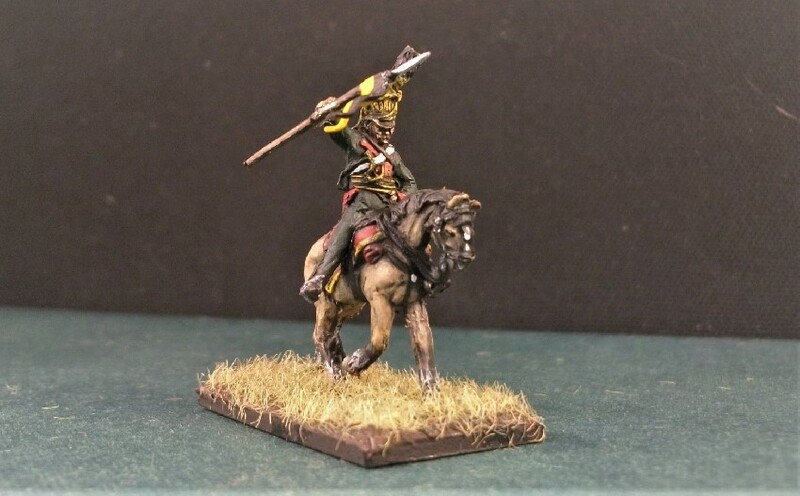 Merveldt garnered considerable experience in the Revolutionary and Napoleonic wars against the French and he was considered a very able commander of cavalry, rising to the rank of general. The No.1 regiment’s headquarters moved over the years, in 1791 it was based in Sárospatak in Hungary, ending the Napoleonic wars in St. Floeian, near Linz. It’s recruiting area was Galicia and most of the uhlans therefore were made up of either ethnic Polish or Ukrainian men. Preben Kannik’s fabulous illustration of a wounded man of the Austrian Merveldt’s 1st Uhlan Regiment. Uhlan Regiment No 1, as with the three other Austrian Uhlan regiments, wore jackets of green (initially ‘grass green’ but later ‘dark green’) with red facings. The pennons on their lances were black over yellow. Trousers were also green with red stripes with the lower part covered in black leather near the boots, although grey overalls could be worn when on campaign. The sheepskin over the saddles appears to have been black, though this is open to question. 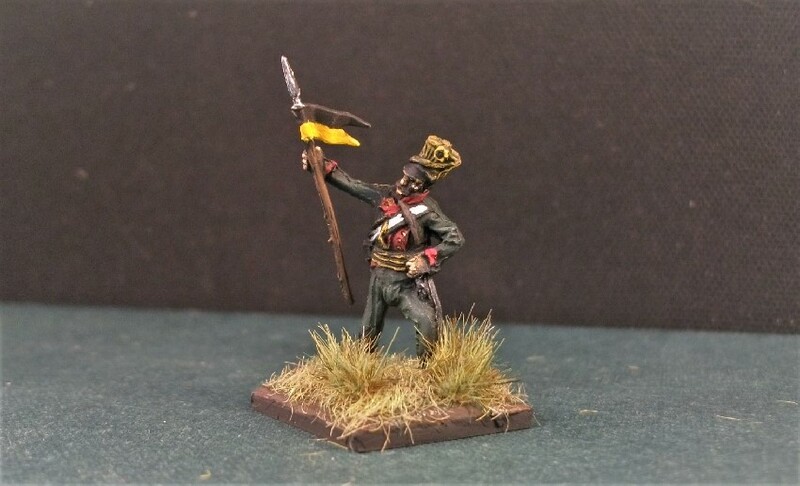 The only regimental distinction was the colour of the czapkas; No.1 having yellow czapkas and numbers 2, 3 and 4 being green, red and white respectively. Another illustration by Boisselier of Austrian Uhlans; No. 4 (left) and No. 2 (right). At Austerlitz in 1805, a handful only of Merveldt’s Uhlans were in the 1st Cavalry Brigade, otherwise the regiment was not represented. During the 1809 War of the Fifth Coalition, the regiment fought at Ursensollen-Amberg. One detachment was at the blockade of the Oberhaus fortress. Parts of the regiment were also involved in the Regensburg battles and later at Stadt am Hof. In July 1809, they were in Bohemia and fought against Saxons in the battles of Gefrees and Nürnberg. Napoleon I. 1809 vor Regensburg by Albrecht Adam. Wiki Commons. Merveldt’s Uhlans did not take part either in the Battle of Aspern-Essling, being instead kept in defence on the Danube later harassing the French rear lines of communication. After the Battle of Wagram, it retreated to Bohemia when the campaign ended. Wojciech Kossak’s “Austrian Uhlan of Savona“, 1891. 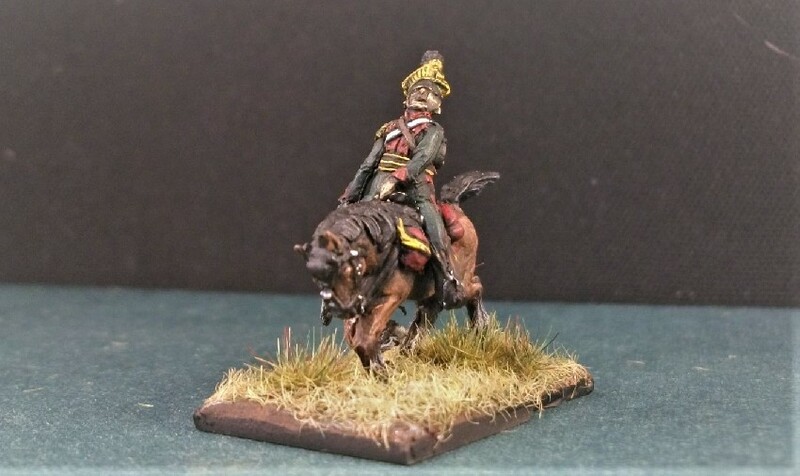 The 1st regiment towards the end of the Napoleonic Wars was fighting in the Northern Italian campaign of 1813-14 alongside its sister uhlan regiment No.2 (Schwarzenberg). Consequently, having largely missed out on the key battles of Austerlitz and Aspern-Essling, they were also to find themselves absent from the decisive Battle of Leipzig in 1813. The regiment’s namesake, Count von Merveldt, however was present at the ‘Battle of the Nations’, where he was unfortunately captured when wandering too close to Saxon troops. In Italy, his regiment continued to do great service however; patrolling, reconnoitring and, as can be seen in the following brief quote I discovered about the Battle of Feistritz, also putting the enemy to flight! 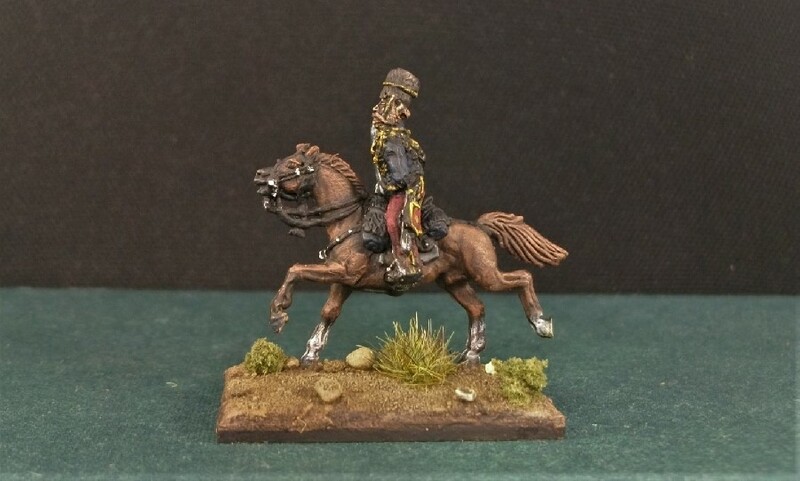 … Austrian Generalmajor Speigel responded quickly, and a very successful charge of the Merveldt Uhlans encouraged the French to withdraw. Notable Battles: Austerlitz, Ursensollen-Amberg, Regensberg, Gefrees, Nürnberg, Feistritz. Number 2 of 25 from “British Uniforms of the 19th Century” – a cigarette card series issued by manufacturer Amalgamated Tobacco (Mills). Number 3 of 25 from “British Uniforms of the 19th Century” – a cigarette card series issued by manufacturer Amalgamated Tobacco (Mills). 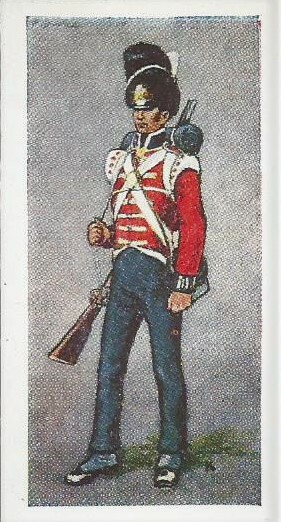 Number 1 of 25 from “British Uniforms of the 19th Century” – a cigarette card series issued by manufacturer Amalgamated Tobacco (Mills).